This site is brilliant, been using it for a long time to recognise which year my cameras have been made! Excellent stuff keep it going :D Learned about new cameras too so positives only haha! A goldmine of reference information. Thank you so much. OMG! ... I haven't seen all the page and i'm just ... speechless :D i saw your cameras in retronaut.com and they're AWESOME! Wish you luck from Mexico City! Hello, when are you going to come to us in Russia? Sincerely Tatyana. This is an excellent site for camera-obsessed people like myself. I did not realize that there were so many different Russian cameras outside the Smena, Lubitel, Zorki, Fed, Zenith, Kiev ranges. I have three Smenas, a Lubitel & a Zenith. I once bought a Zorki 4 new in the 60s - it worked fine except for uneven exposure across the frame width presumable due to focal plane shutter fault. All the cameras are built like "tanks", even the plastic-bodied ones. Thanks again for an ace site. 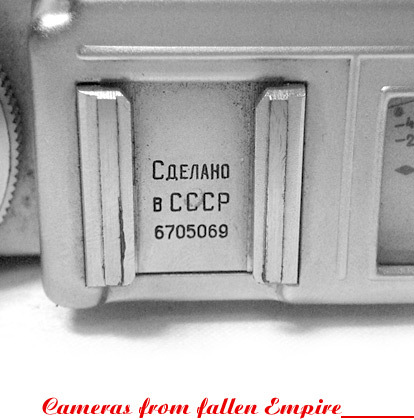 I started collecting Soviet cameras in early 2002. At one time I had more than 100 ranging from an early FED NKVD to Leningrads and Kievs. Now I'm down to about 50 cameras--mostly FEDs and Zorkis. I'm not actively collecting now. You have some excellent information on the variations of the different models. Very informative. thanks for sharing. i would like to write a blog showing the history and models of LOMO LC-A. and request for using some of the information(both pictures and texts) of your page.thank you. Thank you so much for the great reference information on these old cameras! Fascinating stuff!! Very interesting indeed. If you`ve put a collection of Russian lenses, which I presume you have , it would be simply perfect . Cheers my friend. Great homepage, thanks for sharing all the information!